adventuruss: diy christmas yarn wreath. 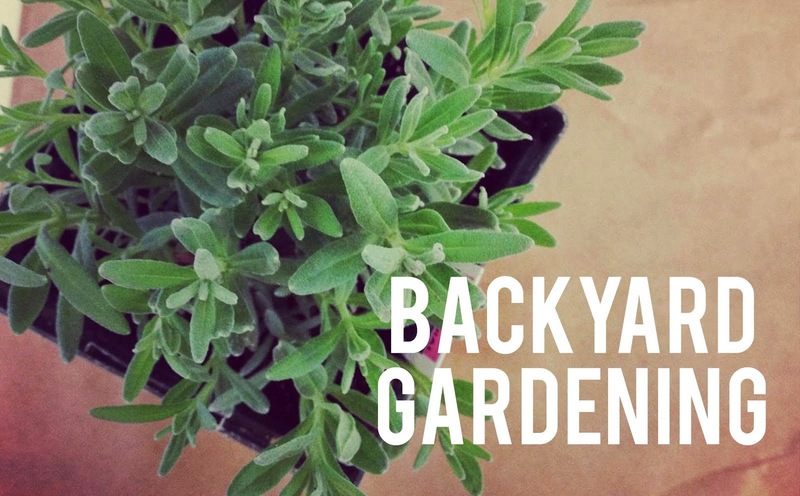 last week i took on my first christmas diy projects. 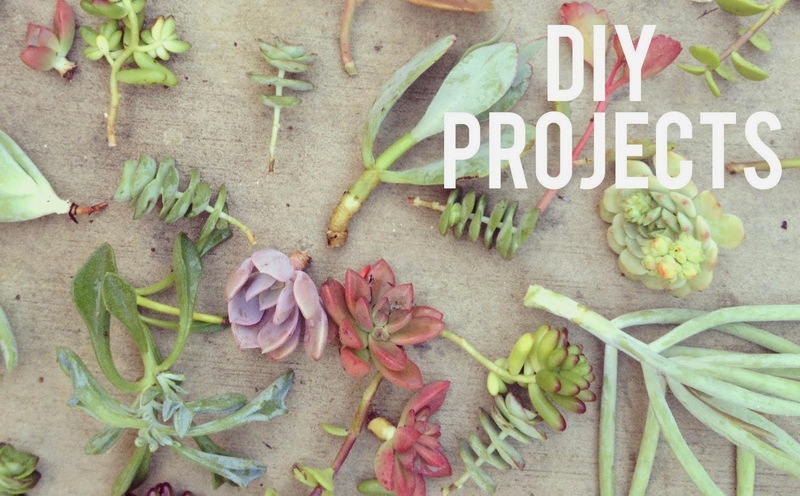 i've been feeling rather inspired lately, but once i get home and settle in, the last thing i'm wanting to do is make a diy-mess. so last week, instead of sitting around like i normally do, i chose to give my handiwork a whirl. needing somewhere to put our holiday cards as they arrive, i thought a festive wreath might be a nice way to display them. i was inspired by this wreath and after a quick visit to michaels for some yarn and a styrofoam mold, i put the office on hulu and went to town. 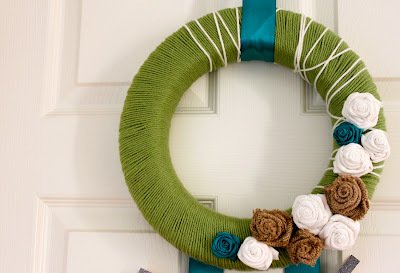 i wrapped the styrofoam with two layers of green yarn, careful to lay each strand as close to one another as possible and once i felt the wreath mold was well-covered, secured the loose end in a tight knot. 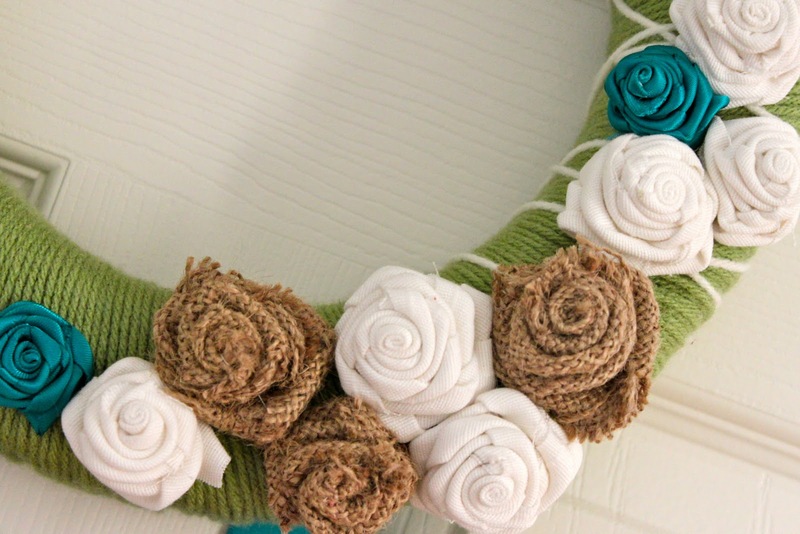 then, using the white yarn, i accented a little over a quarter of the wreath with random loops of yarn. i had some random fabric strips and burlap around the house from one of the basement projects i've been working on, and made a few fabric flowers* to cover the bottom quarter of the wreath. i wasn't loving the white and burlap flowers against the green yarn (it was too blah), so chose to make some more flowers with a bit of left over ribbon. and then i fell in love. it was the perfect pop of color against the organic background. with the same teal ribbon, i cut two equal strips and secured them to the back of the wreath using pins and wrapped another segment of the ribbon around the top of the wreath so we could secure it to the door. i'm a huge believer in staple guns, so we carefully stapled the ribbon to the top of the door and let everything else fall into place. i couldn't be happier. we have our beloved cards hanging from the ribbon with "dressed-up" clothes pins, inspired by this post. all in all, the project only cost about $5.00 in supplies and took at least 3 hours. 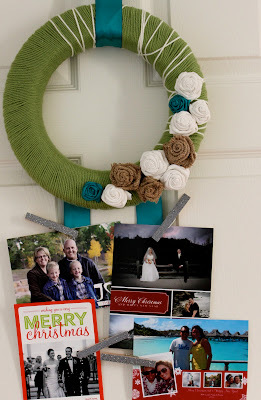 i'm loving how versatile it is and how very easy it will be to swap out the accent ribbon with the seasons. in my opinion, it's the perfect diy wreath. *fabric flower tutorial to come.